The cinematic equivalent of a handful of downers, this is the kind of film which I find myself respecting, rather than enjoying or even liking. Make no mistake, this is well-constructed and particularly well-acted, especially considering the lack of screen experience possessed by its young lead. 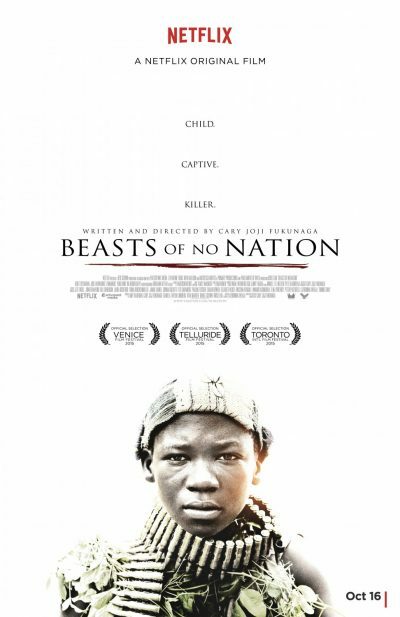 Yet I can’t conceive of any set of circumstances which will lead me to conclude, “Think I’ll watch Beasts of No Nation again.” It’s just not the kind of film you need to experience more than once. This proves to be foreshadowing of the most depressing kind. For we follow Agu as every last semblance of humanity is squeezed out of him, through force of necessity. His first – but not last – kill involves him macheteing a prisoner to death, egged on by the Commandant. Drugs help numb Agu’s senses. He’s sexually abused by the Commandant, who becomes some kind of demonic father figure – yet is being cynically manipulated for the purposes of others, just as he manipulates Agu. And the body-count rises inexorably, most notably in a chilling single shot, which accompanies the soldiers as they swarm through a house like a pack of sharks. After the first 10 minutes, depicting a relatively happy (if mind-bogglingly poor, by Western standards) family life, it’s almost inexorably downhill. Think Requiem for a Dream about child soldiers, and you’re in the right area. I should stress the “almost.” For there is some light at the end of the tunnel, as even the soldiers simply become weary of the unending struggle and abandon the Commandant. However, the question of what future Agu may have is left deliberately vague. It’s not inconceivable he is simply too broken to function in normal society. The Commandant’s final line hints chillingly at what may be in Agu’s future: “I will call for you again… and you’ll come. Remember.” Fukunaga wisely avoids any overt political message, and simply lets the story and its characters speak for themselves. While the message may not be anything revelatory – war is hell, who knew? – the movie’s willingness to get, literally, down and dirty in the trenches give it an immediacy that isn’t easy to forget. Won’t stop me from trying, however.